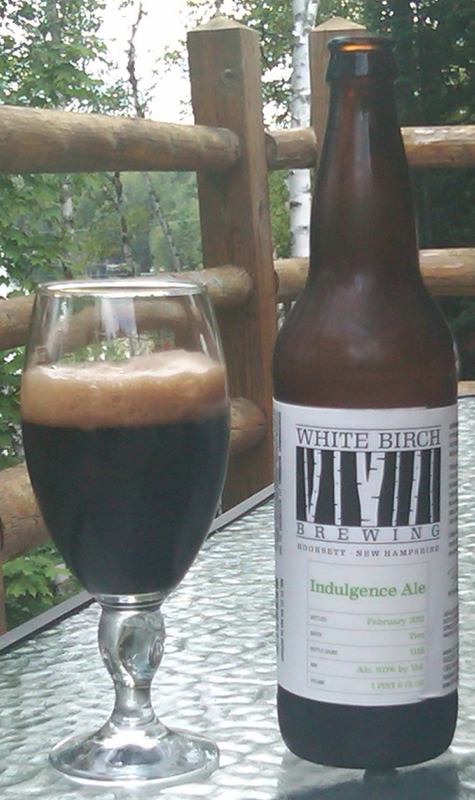 A relatively young brewery has been making a bit of a name for itself here in New England, White Birch Brewing. I had a chance to pick up some bottles, and on a recent vacation on Moosehead Lake , I tried them out. Their website says that this beer, while black and roasty, is not a porter or a stout. They use chocolate malts to impart the color and flavor to this beer. The label said this beer was brewed in February, and is 8% ABV. Taste: Very heavy roasted malt taste, bitter chocolate, coffee. It just overwhelms everything else. I would describe this as mostly stoutlike, but it was a bit harsh and not as smooth as I would have liked. The aftertaste was more of the same, with the roasted taste lingering. As it warmed up, I did get some fruitiness, but it was hard to pick out. There was a decent bitterness to the beer, but how much was hops vs how much was more an astringency from the grain I had a hard time picking out. Ok, so this was not my favorite. I love stouts and porters, but I did not care for this all that much. It was just too much of one note, it overwhelmed anything else, and it has a sharpness that went with it that seemed a bit overdone. It was drinkable, but it just seemed kind of one dimensional. I appreciate their experimenting but I would like to have a smoother roastiness to the beer, I think it would have brought out more residual sweetness and yeast flavors. My wife, who likes stouts, first comment was “It tastes smoked and burnt” and quickly gave me her glass. I think that kind of sums up the beer.